Over the last three decades there has been a rapid expansion of intensive production of fresh fruit and vegetables in the Mediterranean regions of south and west Europe. Much of this depends on migrating workers for seasonal labour, including from Eastern Europe, North Africa and Latin America. 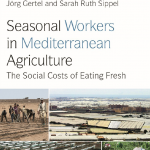 This book edited by Jörg Gertel and Sarah Ruth Sippel is the first to address global agro-migration complexes across the region. For further details see attached flyer and visit the website of the book. This entry was posted in Books on May 7, 2014 by admin.